So it’s worth celebrating when you come across a gem. And based on two visits this weekend, Loungers is somewhere to return to time and again. It looks like there are currently about a dozen branches in England. Not only do they have a good vegetarian menu, there’s also a vegan one which restores your faith in restaurants (mind you, Loungers call themselves café bars). And if you need gluten-free food, there’s a choice for you as well. The only slightly odd thing is that the vegan and gluten-free menus aren’t out on the tables, and I suspect most people wouldn’t think to ask for them. We only found out in advance because my sharp-eyed partner in crime Anth had found the website. Three of us visited the Westbury-on-Trym branch of Loungers for a Friday night meal, then again on the Saturday for brunch. The decor is all wooden tables and chairs, and comfy sofas. You find a table and then order at the bar. As you might expect, Friday night was busy and we nabbed the last free table upstairs. Saturday we sat downstairs by the big open windows. The place had a nice buzz to it both times and we all commented on how cheerful and friendly the staff were. Friday night’s choice boiled down to my guilty pleasure of a burger and fries (funny how I’d never have dreamed of eating one back in the dim and distant days of meat), or a selection of the tapas. Eleven out of 16 of the tapas choices are vegetarian, and seven are vegan. 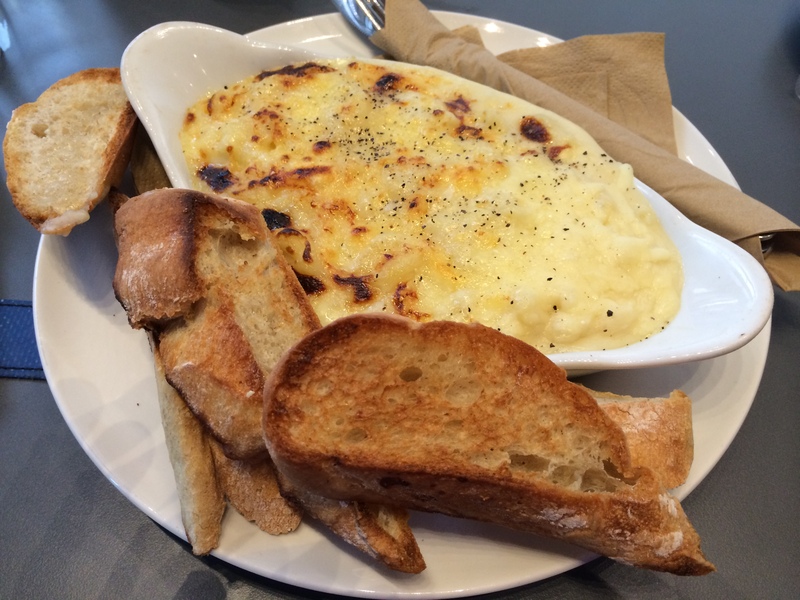 The dishes are £3.25 each or three for £8.50, and come with ciabatta bread. Three is a good amount for one person, based on my friend Linda’s choices. She went mainly for meat, but we did sneak a taste of the potatoes with smoked garlic and wasabi aioli which were very moreish. 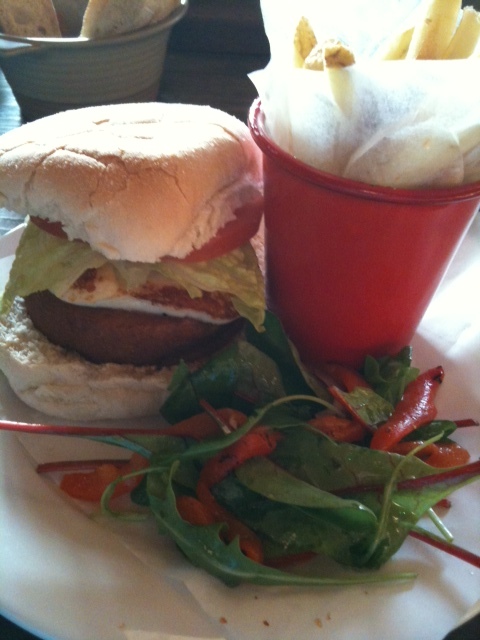 OK, so both Anth and I went for the burger – butternut squash and nutmeg falafel, served with grilled halloumi, chipotle salsa, cos lettuce and tomato (it becomes vegan with the disappearance of the halloumi!) And very good it was too, with a decent texture and subtle flavours. The chips met with universal approval, as they were proper chips and not skinny fries which turn into twigs after ten minutes. A small side salad completed the ensemble. We didn’t have dessert, but Linda claims the warm chocolate brownie with vanilla ice cream and chocolate sauce is to die for. And I fully intend to try the vegan dark chocolate and ginger torte. 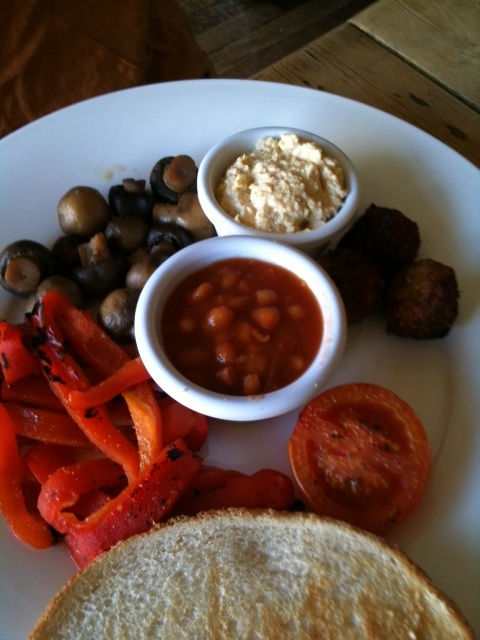 The vegan brekkie came with falafel bites, warm hummus, grilled red pepper (not something I’d think about for breakfast, but very nice), button mushrooms, grilled tomato and baked beans, plus a generous slice of toast. The rather unusual combination worked really well, and it was only much later that I realised it hadn’t come with the advertised diced crispy potatoes! The vegetarian version comprised mini sweetcorn fritters, hash browns, tomato, beans, mushrooms, peppers and toast, together with two fried eggs. I didn’t hear any complaints from Anth. Oh, and there was freshly-squeezed orange juice and very respectable coffee. And some more chatty staff kept up with the busy Saturday morning comings and goings. Loungers is definitely a good find whether you just fancy lounging around and drinking coffee, or want something a bit more substantial. In January 2013, Coffee7 vegetarian cafe opened its doors to a grateful and expectant Forest Gate clientele. An attractive and welcoming place, with vintage furniture and crockery, fresh flowers and genuinely friendly staff, it has a small menu of simple, well-made dishes (with the ‘special’ changing each day), good coffees and teas, and delectable cakes. The atmosphere is relaxed, with a children’s play corner, a little outside sitting area and a snug side room with comfortable sofa and shelves of books to browse. I recently visited for lunch midweek, and was pleased to see the place busy. 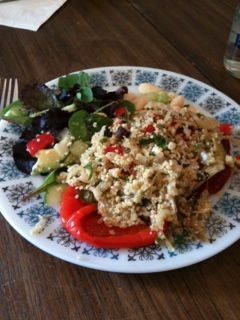 I chose roasted pepper stuffed with cous cous and served with green salad and butterbean and celery salad, while my friend went for the houmous with wholemeal bread and salad. Other choices included a salad platter and sandwiches made with your choice of speciality cheeses and relishes. I didn’t have the chance to photograph my friend’s meal as she tucked in enthusiastically while I was snapping mine! She found her homemade houmous garlicky and delicious, while the wholemeal bread was moist and had a light, open texture. She was especially pleased to find avocado in her accompanying salad! My peppers were nicely gooey and softly collapsing, and generously stuffed with cous cous gently flavoured with onion, cheese and parsley – and extremely well-priced at £6-00. Sadly, we had no room for pudding, but chocolate brownies, sponge cake and huge home-baked cookies are typical sweet offerings. The café has quickly established itself as a popular meeting place and is particularly lively at weekends. When we visited, it was hosting an exhibition of work by a local artist, and it acts as an information hub through its ever-growing noticeboard. I’d recommend it whole-heartedly. You’ve got to love a place with a cunning plan and a niche idea – and Pie & Vinyl in Southsea has both in spades. And it does what it says on the tin – pie, mash and mushy peas served in the congenial setting of a retro record shop. I’m all for supporting independent record shops – particularly when they serve me one of my guilty pleasures. This isn’t fine dining – the pies are bought in, and the mash and peas are served from a hotplate. But the food is well-chosen; decent Pieminister and Buckwells pies, which can be eaten alone, or accompanied by a £6.50 meal deal (pie, mash, mushy peas and gravy or liquor). There are a couple of dozen pies on the menu, but not all are available every day. Vegetarians get two or three to choose from – the three cheese, red onion and spinach pasty is tasty, as is the oozingly-rich Wildshroom and asparagus (wild mushrooms, asparagus, shallots, white wine and cracked black pepper). And the gravy’s good as well – thick, well-seasoned and yay, vegetarian! Half of Pie & Vinyl’s charm is the setting. It seats no more that about 16, and it’s snug to say the least. So save your secret business deals for another setting. Tables, chairs and charmingly-mismatched crockery look like they’ve come from your gran’s parlour. 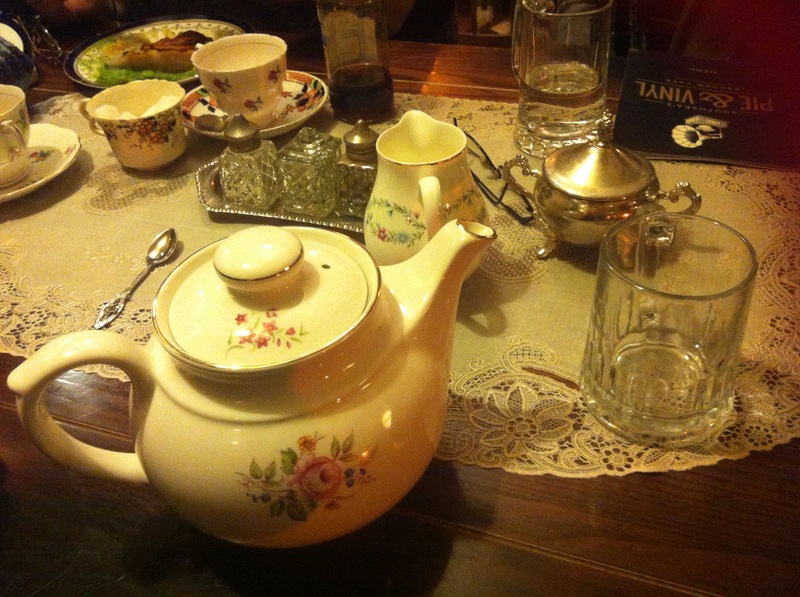 And the cordials – served in eccentric teapots – are the kind of thing you’d have taken on your picnic in the 1950s. These include dandelion and burdock, rhubarb and rosehip, and the intriguingly-named sarsaparilla, which was described by my rather brisk friend as tasting like cough medicine. Whatever, it definitely cleared my tubes, matron! And for £1.75 you’ll get three or four glasses out of the pot. The front part of the shop has poster art for sale (I know I’m going to end up buying that PJ Harvey and John Parish one before too much longer), and the records live in the tiny back room. And yes, it’s vinyl, which has never really gone away in certain quarters. If you’re desperate for a new turntable, you can buy one of those as well. The guys who run Pie & Vinyl are friendly, and have clearly found their clientele – the slightly bohemian Southsea crowd, with a preponderance of students who gravitate towards cool new places to hang out, along with the 40-somethings who remember vinyl from the first time around. They’re also promoting the café for meet and greets for musicians who might be playing the Wedgewood Rooms that evening. A colleague of mine is still hyperventilating after being no more than a foot from David Gedge of The Wedding Present … Takes all sorts! Check the website for opening hours, which do vary, including a later closing time on Thursdays, Fridays and Saturdays.